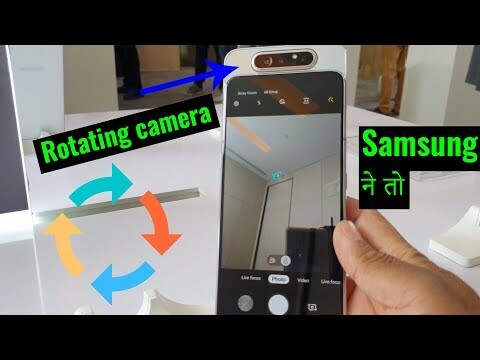 Expected price of Samsung Galaxy A80 in India is expected to be Rs. 29,990. Samsung Galaxy A80 Expected to be launched on 16th May 2019. The 512GB / 8GB variant of Samsung Galaxy A80 costs around Rs. 29,990 and expected to available in Silver, Dark Blue and Midnight Black colour. The Samsung Galaxy A80 is a mid-range smartphone that comes with robust configuration and amazing features. Its large screen and sleek design make it more appealing to eyes. It also comes with a good set of cameras that clicks amazing pictures and holds sufficient battery backup. There is a fingerprint scanner, which enhances security. The Samsung Galaxy A80 flaunts a 6.7-inch bezel-less AMOLED display. It comes with a resolution of 2,340 x 1,080 pixels having a density of 385 PPI, which adds brightness and sharpness to its contents. It also possesses a water drop notch and the large screen is protected by Corning Gorilla Glass 5. The device gets power from Li-Po battery having a capacity of 4,000mAh, which provides sufficient backup for long hours of activity. It also facilitates fast charging feature, which keeps you connected with the virtual world. The smartphone is armed with 48MP + 16MP + 5 MP triple rear cameras that click pictures with greater depth and clarity. The presence of the third lens makes it appropriate for taking wide-angle snaps. It also comes with a 32MP front-facing lens that captures beautiful moments and selfies. The device houses 64GB internal storage, which is sufficient to keep files and data. It also comes with an additional option of expanding storage capacity up to 512GB. The device is equipped with octa-core Qualcomm Snapdragon 845 processor that runs at a speed of 2.2GHz. It is further coupled with 6GB RAM, which successfully multiple tasks without any lagging issue. For the graphics, it comes with Adreno 616 that provides a good gaming environment. The smartphone comes with a wide range of connectivity options such as WiFi, 2G, 4G LTE, Bluetooth, 3G, NFC, VoLTE, USB type C and Mobile Hotspot.